If you love pianos then you will most certainly be interested in this superb one day trip to the Schimmel Piano factory. Peregrine’s Pianos, London’s exclusive dealer in Schimmel Pianos, is offering its customers an opportunity to visit the factory in Braunschweig, Germany. The one day visit, on Tuesday 30th September 2014, will provide an excellent opportunity for anyone who enjoys observing the intricacies of building this complex instrument, and also for Schimmel lovers who are already aware of the range of pianos available and would like to learn more. Schimmel pianos (the largest volume German piano manufacturer) was founded in Leipzig in 1885. The present modern factory (pictured above) is close to the centre of Braunschweig and is purpose-built. It takes the form of numerous work areas dedicated to specific parts of the process – frame and soundboard manufacture, casework, key making, piano stringing, action alignment, silent piano installation, final assembly and finishing. Schimmel Pianos run a comprehensive training scheme for apprentices and planning ahead is key in the company’s thinking. Care about wider issues is also highly important; for example timber is carefully selected from regenerating forests. Full details of the day will be given to those joining the visit. The trip will begin at Heathrow, London at approximately 7am and arrive back there at about 9.30pm. After a short flight to Hannover there will be a special coach transfer to the factory. 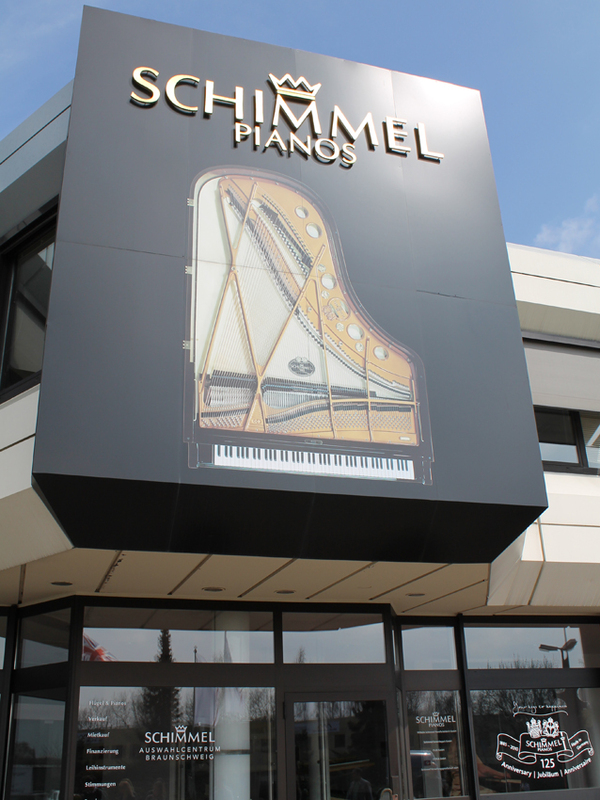 On arrival, guests will then be introduced to senior staff at Schimmel Pianos and entertained to a factory lunch. The visit will include talks from the management team, an extended tour of all parts of the factory and opportunity to try pianos in the “selection room.” The day will also feature a short recital, a visit to the old city, a group meal in Braunschweig and the return coach transfer to the airport. Places on this visit are limited and those interested in joining it will need a valid passport and should contact Peregrine’s Pianos as soon as possible. There is a nominal charge of £250 per person which includes all items listed in the itinerary, and Peregrine’s Pianos will be pleased to discount one person’s charge against the subsequent purchase of a Schimmel Piano.